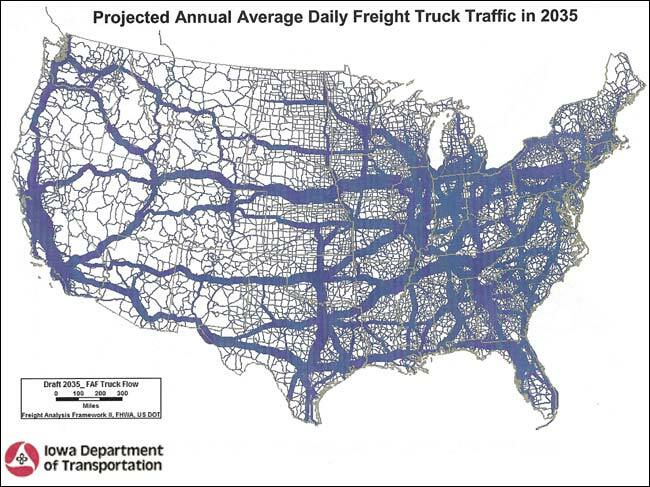 By 2035, anticipated freight traffic increases to remarkable levels. In fact, traffic in the Quad Cities area on I-80 will be at a level where emissions will create concern for air quality. When complete, four-lane US 20 will help divert traffic from Iowa's only four-lane east-west corridor. NOTE: The Newsletter, Membership, Contact Us, and Retreat Information sections are printable documents in the Adobe Acrobat format and they will open in a new window. When you are finished with those pages, just close them to return here.